The White Rock Oasis Cotton Hat combines the traditional styling of a bucket hat with all the technology we've come to expect from White Rock hats. The Oasis is Teflon coated making it water and stain resistant, and like the other hats in the range has Bug Off technology impregnated into the fibre preventing nasty bites. The Oasis Cotton also has the Hydro Cool Crystals system, providing heat relief and concealed passport pocket inside the anti-bacterial headband. 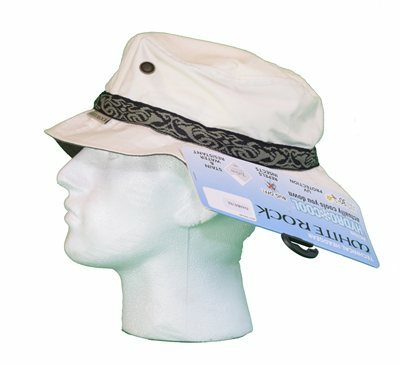 A purpose built hat for life outdoors, the Oasis Cotton Hat gives maximum sun protection with SFP30 making it an ideal travelling companion for any outdoor activities from camping to fishing and hiking. The Oasis Cotton Hat with Band also features an attractive design banding around the hat. PLEASE NOTE: This hat comes in cream with three different band options Black/grey, Black/green or Black/brown. A band colour will be selected at random unless you state a orefered colour in your customer order notes. Stock depending we will provide you with the requested colour.